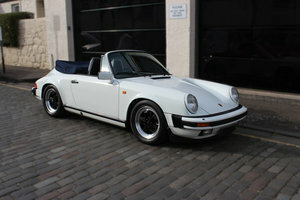 1976 Porsche 930 Turbo Carrera 3.0 This is the earliest and most sought after 3.0 Turbo, in absolutely stunning condition. 2 long term owners (1977-1983) and (1983-2013). Has just come out of full restoration to include the following: - Full bare metal glass out respray - New leather/tartan interior (back to the original spec, as per CoA), to also include new dashboard, sunvisors etc. - All new rubber seals/door seals, bumper protectors, front valance, rear 'Porsche' reflector, side sill mouldings etc. around the car - Brake and suspension/bushes overhaul - New stainless steel performance Dansk exhaust - New Michelin tyres and refurbished Fuchs alloys - Full engine service The car is absolutely rust free, no welding whatsoever. It comes with: - Full service history with every single bill/receipt - Porsche Certificate of Authenticity - Matching Numbers car - Full photographic record of restoration - Original owner's manual and service book - Original tool kit and air pump - All Fuchs alloys original and correct dated (6/76), original matching spare wheel - Limited Slip Differential (Factory option as per CoA) - Very Rare Blaupunkt Equalizer and Stereo (Factory option and comes with all manuals etc) You will not find a better early Turbo 3.0! Viewings by appointment. Feel free to contact me for further information.